Same grubby tables but commendably friendly and cheerful staff. Windswept - Blonde 4.00 Hints of cardboard and tin foil overlaid a sound, if unexciting, traditional, light bitter. At least the tables had been cleared but not wiped down. Sambrook's - Junction 4.50 Workmanlike malty best bitter. My worst ever visit to a Wetherspoon's? Walked in to a sea of empty tables strewn with glasses and plates. Long queues at the bar. Any beer of even vague interest 'Available Soon'. Walked out. Dreadful. Relatively quiet. Typical beer range. Saltaire - Pacifica IPA 5.50 Good value at Â£1.99. Selling well. Every empty tables piled up with dirty glasses and plates. Phoenix - Hopsack 3.80 Thin. Borderline 2*. Grubby tables, willing staff. Dull beer selection. Redcastle - Red Lady 4.00 The sort of dull twiggy beer which gives cask ale such a bad name. Seems to be going downhill. Poor beer selection/quality. Unpleasant musty smell in the corridors. Salopian - Shropshire Gold 3.80 Well past its best. Usual struggle to find a drinkable ale. Usual grubby tables. Everards (see entries against Joule's & Robinsons from now on) - Arcadia Session Pale Ale 4.50 Thin for abv with some limited US hops. As a homebrewer I would be disappointed if I'd brewed this. Grubby tables. Fine selection of dull brown beers if that's your thing. Uprising (sub-brand of Windsor & Eton) - Treason West Coast IPA 5.80 American style IPA. OK but no finesse. Hanlons (formerly O'Hanlon's) - Firefly 3.70 Dull, brown and characterless. Lots of dirty tables. Run out of nuts and crisps. Mediocre beer choice most -available soon'. GBG 2017? Not on this form. Wooha - Porter 5.00 OK but not very interesting. Stonehenge - Pigswill 4.00 Mediocre bitter. 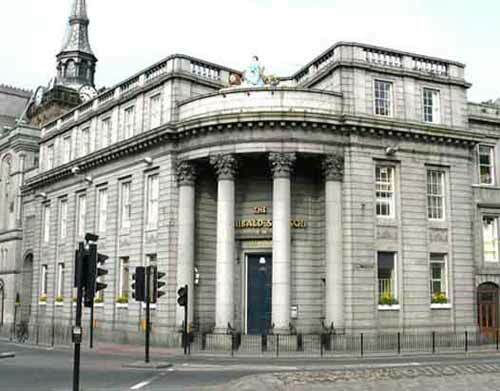 The pub is found in Aberdeen, Aberdeenshire, AB11 5BQ. Typical Spoon's bank conversion with typical Spoon's mix of customers but also a manager who knows about real ale and keeps a good variety of beers in good condition. Aberdeen CAMRA Town Pub of the Year 2009. We have visited this pub 207 times, seen 410 different beers and tried 259 of them.